I recently returned from another short weekend trip to Europe. I’ll have a trip report up eventually, but the primary purpose was to review Scandinavian’s business class. That got me as far as Chicago, which meant I needed a positioning flight home. I decided to use the opportunity to try Spirit’s Big Front Seat. I already reviewed Spirit in a previous post. There’s nothing new to report, so I won’t write up a full review. However, I did want to share some general impressions of the Big Front Seat. Spirit sent me an e-mail warning to expect long lines at bag drop and security at O’Hare. Therefore, I braced myself for the worst, but everything turned out completely fine. At 6:15 pm on a Monday, I was the only person in line at bag drop. And the Pre-Check lane was similarly empty. It literally took 10 minutes from start to finish. I still hear horror stories about long lines, but I’ve enjoyed painless experiences both times. Maybe I’m just lucky. The only adventure? The people mover between the international terminal and Terminal 3 remains out of service. I found a shuttle bus line snaking the entire length of the terminal – at least an hour wait I’d guess. With no time to wait that long, I ended up paying for a Lyft to go between terminals. Much to the amusement of the driver, I’m sure. I share this as a warning for those with short connections to or from Terminal 5. Despite O’Hare’s assurance of “prompt and reliable service”, have a backup plan in case you find long lines. I overheard at least one person complain about missing a flight due to the long wait. Spirit charges for all advance seat assignments, but not all seats are created equal. 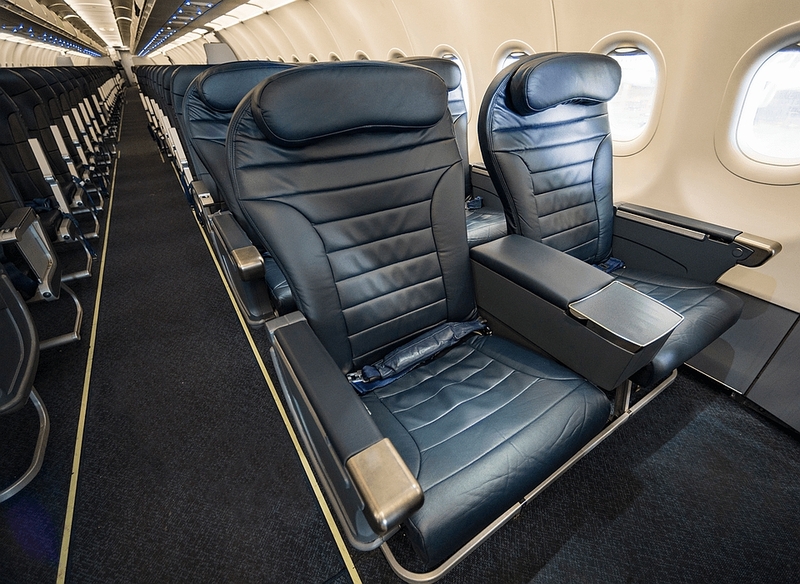 Most Spirit seats feature measure 17.75″ wide, with 28 inches of pitch. It’s a tight fit, though maybe not as bad as I expected. The thin seats mitigate the pitch issue somewhat. Fees for standard seats range from $1-50, depending on route, and if purchased online or at the airport. Spirit also offers an upgraded option, the “Big Front Seat”, with 2 rows in a 2×2 configuration. 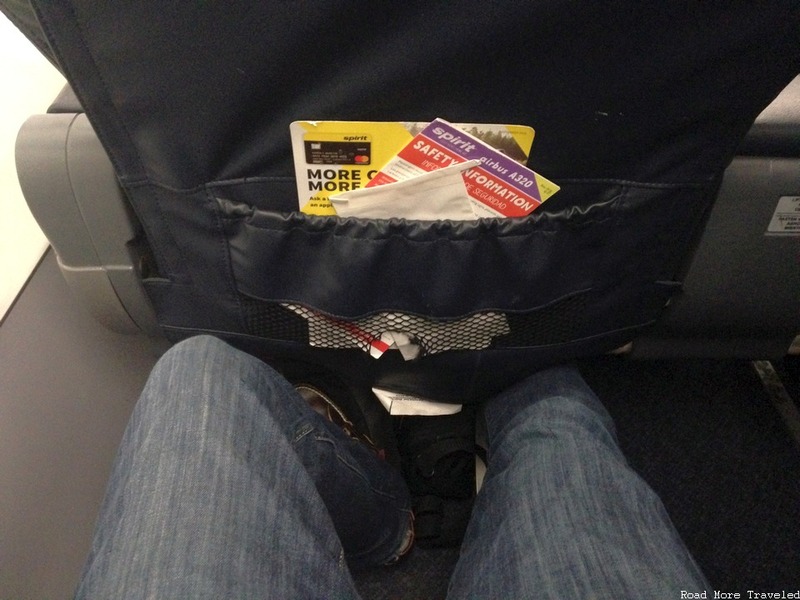 With 36 inches of pitch and 20 inches wide, it’s basically a domestic First Class seat. 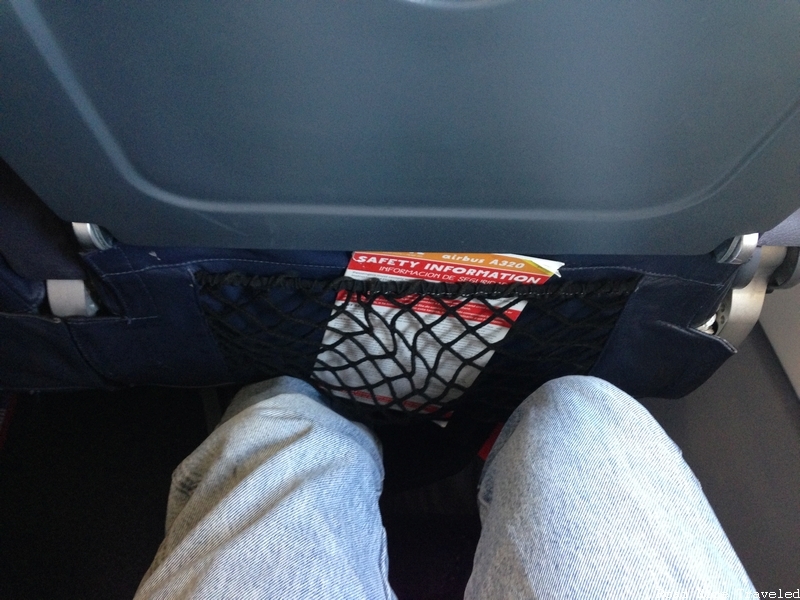 (By way of comparison, Delta’s Airbus A320 aircraft feature 36 inches of pitch/21 inches of width in First.) Like Spirit’s standard seats, the Big Front Seats don’t recline, either. Indeed, I found legroom about on par with a domestic First Class seat. 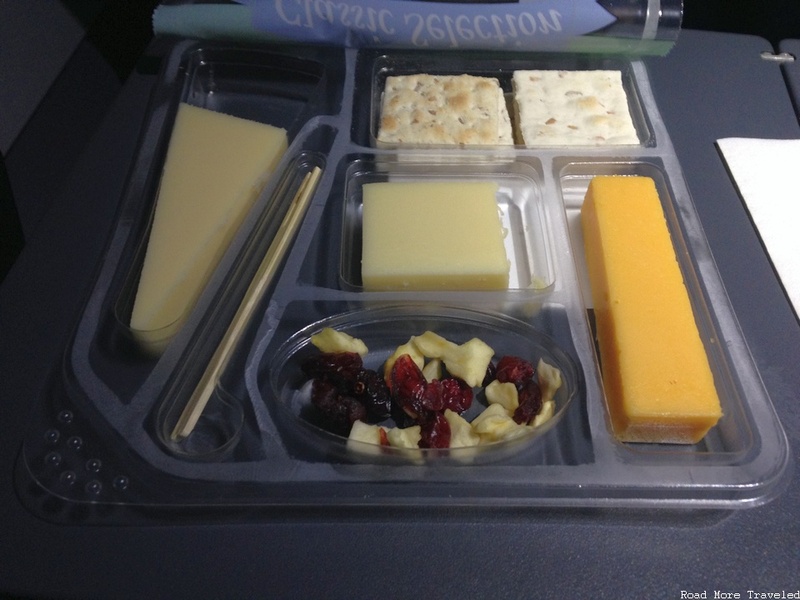 Padding isn’t quite as good, but honestly, no worse than the slimlines found on American’s newer A321 fleet. Big Front Seat fees range from $25-175. I paid $33 for Seat 2A, bringing my total for the flight and seat to $91. Yes, you read that right – $91 for a domestic First Class seat. I’d say that’s not bad at all. When you buy Spirit’s Big Front Seat, you literally just buy the seat. Everything else about the on-board service is exactly the same as a standard seat. The seat fee does not include bags, either a carry-on or a checked bag. About the only “benefit” you receive is Group 2 boarding. Food (really snack items) and drinks are available for purchase. Snacks seemed reasonably priced, though $3 for sodas is kind of a rip-off. I ended up ordering a cheese plate and ginger ale for $10. I found it perfectly fine. Finally, Spirit offers no entertainment or power ports onboard, and that includes the Big Front Seat. However, Spirit plans to install Wifi on its entire fleet by September, 2019. This actually pleasantly surprised me. I’ve heard lots of stories of bad service and long lines when it comes to Spirit. But on both of my flights so far, I’ve experienced none of that. Indeed, from the check-in staff, to the gate agents, to the flight attendants, to the pilots, every Spirit employee I encountered was great. During our delay, the FAs actively made friendly conversation with passengers. Once the pilot arrived, he personally apologized for the delay and provided a full explanation. Then there’s little things like the bag drop agent smiling and wishing me a pleasant flight. How often does any of this happen on, say, American these days? With the legacies’ race to the bottom with Basic Economy and “densification” of aircraft, I’m finding fewer and fewer reasons NOT to consider Spirit. Even with an additional fee for a checked bag, my total charge came to $131. In the Dallas – Chicago market, American and United offer similar Basic Economy fares. But the ability to even select a seat is highly restricted, and you don’t even have an option to take a carry-on. (Technically, American allows one, but with Group 9 boarding, good luck finding an open space.) On United, you don’t even earn elite qualifying miles. And frankly, I found service on Spirit better than what I get on American these days. Furthermore, a Big Front Seat with a carry-on prices competitively with “standard” economy products on the legacies. Take a look at a random Monday in January. Spirit prices out at $57; adding a carry-on ($35) and a Big Front Seat ($40) brings the total to $132. American and United both charge $171 for standard economy. So really, you get a much better seat for less money. I’d rather take the $40 than a few hundred (increasingly worthless) AAdvantage miles, personally.